Is 'HD vinyl' coming to a turntable near you? The technical specifications for an 'HD vinyl' format have been patented by an Austrian company called Rebeat Digital, it's being reported. Digital Music News claims to have seen a copy of the patent application, and says that HD vinyl could offer 30% more capacity, 30% greater volume and double the audio fidelity of the records you're currently listening to. There are further upsides to this high-def format, too: a new manufacturing process (based on 3D-based topographical mapping combined with laser inscription technology) is said not only to deliver a superior product, but also to speed up the time it takes for vinyl to be produced. 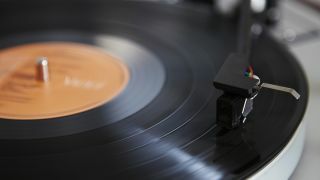 What's more, HD vinyl will be backwards compatible and play on existing turntables, though you'll need a new HD turntable to enjoy its performance benefits. It's being speculated that the new format could come to market within three years. That's not too far away, though we might all be listening to our music on cassette tape again by then, or maybe it'll be time to bring back another supposedly dead format. Who's ready for the CD revival?